Playa del Duque is separated from the rest of Iberostar Grand Hotel El Mirador by a massive rock formation jutting out of the sea. The landscape acts as a natural curtain lending the beach an air of detached exclusivity. The main building of the nearby resort dominates the backdrop to the beach. With its Canarian beach-side architecture, it adds up to the sophisticated feel of the beach. From the hotel, the artificial, smooth and light sands gently slope to the crystal-clear waters. The calm and shallow waters are perfect for a relaxing dip. Because of this, Playa del Duque is considered as the most child-friendly beach on the southern coast of Tenerife. Playa del Duque is also a favorite among visitors who’d love to catch some rays in a picturesque setting. The St. Tropez style beach huts and bamboo parasols dot the beach in an organized, charming manner. For guests who want to have a relaxing stroll and soak up the scenery from afar, there is a wide promenade nearby. The lovely palm-tree lined promenade runs the full-length of the sand. When hunger strikes, there are plenty of quaint cafes, and restaurants visitors can choose from. This picture-perfect beach is ideal for beach lovers and visitors who want ultimate relaxation. A beach this good deserves to fly the Blue Flag with pride. This prestigious status has been awarded to Playa del Duque for its cleanliness and world-class facilities. Bask in the heat of the sun, play in the sand or swim in the warm, crystal clear waters of Playa del Duque. Sit by the shore and order refreshing drinks from any of the resorts or restaurants. Playa del Duque has a more relaxed atmosphere than the rest of the beach resorts in Costa Adeje. The waters, in accordance to the ambiance, is also gentle and shallow. Anyone who’s visited Playa del Duque would say that this is the best place to enjoy a leisurely dip in the waters. For visitors looking for pulse-racing adventures, there is a water sports center by the beach that offers equipment lease. Banana boat, jet ski, wakeboard, and sports boat are available for rent. Visitors who want to take their adventure to new heights may also want to try parasailing. Hugging the shoreline is a wall of straw umbrellas and another wall of rainbow colored parasols. Sunbeds for rent are available for those who skipped beach mats in their luggage. To complete the beach scene, vendors carrying baskets of tropical fruits parade between the visitors. There are also masseurs gently kneading the sunbathers’ muscles. Aside from its picturesque beach, Playa del Duque is also known as a great shopping mecca. First on the list is Plaza del Duque Commercial Center (Centro Commerical Playa del Duque), an upmarket shopping mall. The mall is arranged as a circle of shops and restaurants surrounding an inner courtyard. This modern shopping center is home to top designer shops Cartier, Escada, and Mango, among others. There is also ample parking space where the sight of parked Ferraris, Mercedes and BMWs are not so unusual here. For a more authentic option, guests may stroll the narrow streets of El Mirador Commercial Center (Centro Commerical El Mirador). This shopping center is a replica of a typical Canarian village. It features beautiful squares with a variety of restaurants and cafes. Many of the shops featured here do not belong to big commercial corporations. Therefore, purchasing unique items here is equivalent to helping out local artisans. Playa del Duque is located about 20 minutes by car from South Airport. Primary access from the airport is on TF-1 Road to Costa Adeje. To get to the beach, take exit 30 and go another 1.7 kilometers from the main road. Visitors driving on their own may also use these GPS coordinates: 28.0914° N, 16.7439° W.
The excellent hotels and apartments in Playa del Duque are one of the reasons why tourists flock to this part of Costa Adeje. From 5-star hotels to comfortable apartments, each accommodation never fails to deliver an impressive holiday feel. This family-friendly resort is located on the boardwalk, within a 15-minute walk of Del Duque Beach. Its proximity to Plaza del Duque Commercial Center is also a bonus to its guests. This 5-star hotel resort offers a full-service spa and spacious rooms with premium beddings and thoughtful touches like bathrobes and slippers. This adults-only hotel offers direct access to Playa del Duque. Aside from its own El Mirador Commercial Center, the prestigious Plaza del Duque Commercial Center is also within walking distance. The full-service spa, balconies that offer great views of the ocean and other modern amenities are well-loved and praised by its visitors. There are also three restaurants, and several mini bars guests can choose from. Located just 5 minutes from the beach, this 5-star hotel overlooks the island of La Gomera. Aside from stunning views especially during sunset, this hotel offers a full-service spa and outstanding amenities. It is also home to two restaurants. This modern apartment is surrounded by lush garden and features three swimming pools and two private restaurants. The apartment consists of 3 bedrooms, each with bathroom en-suite, spacious living room with kitchen and terrace. Aside from the garden, the terrace offers a partial view of the sea. The building is located in a quiet place, a three-minute walk from the sea and the famous promenade. This apartment complex is set in the heart of Costa Adeje, just 400 meters from Playa del Duque. The complex features a delightful subtropical garden and balconies that offer excellent views of the sea. It also has an outdoor pool, fitness suite, squash courts, and a sauna and massage center. It’s a crime to visit Playa del Duque and not visit the restaurants and bars lined on the boardwalk. Visitors will find some of the most delicious tapas and seafood in town in this part of Costa Adeje. Located on the beach promenade, the La Hacienda offers an exquisite gastronomic adventure in a perfect setting. Food is delicious and has a variation of the Italian, Mexican, and Spanish menu. The outdoor seating is ideal especially during the afternoon when the cooler air and orange skies provide a romantic vibe. For delightful seafood and Mediterranean option, La Torre del Mirador Restaurant is the place to be. Nestled between two upmarket hotels, the restaurant balcony provides unobstructed views of the Atlantic Ocean and La Gomera Island. This family-run restaurant is highly regarded by its patrons for its food, view and friendly staff. Visitors who want to take a break from the usual coastal scene find haven in this quaint cafe. This cafe restaurant is not on the beach front, but it does overlook the beach, palm-tree lined promenade and Mount Teide. The scene is as delightful as their cuisines which are mostly Mediterranean. Cafe del Mar is especially magical during sunset. 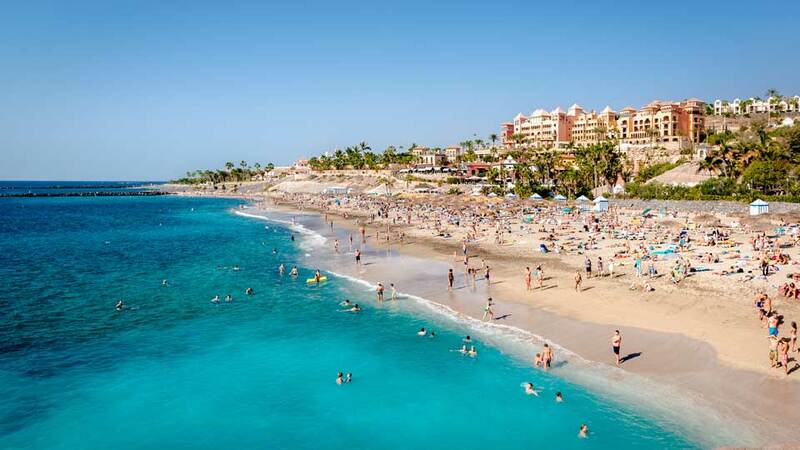 Playa del Duque is easily the best beach in Costa Adeje, let alone the South of Tenerife. The sun, sea and the unique view are the main selling points of this award-winning beach. Its modern amenities and classy atmosphere are noteworthy. Fine, light sand forms the surface, the beach is immaculate and well maintained, and the sea glistens in splendor. Its beautifully laid-out promenade and shops also contribute to the charm of this tropical paradise. All these, and more offer visitors an all-around enjoyable experience like no other.